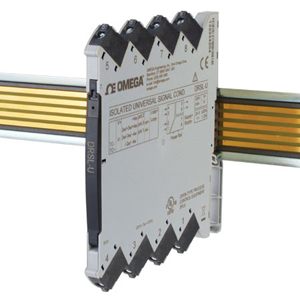 The DRSL-U isolated universal input DIN rail signal conditioner provides a competitive choice in terms of both price and technology for galvanic isolation of process signals to SCADA systems or PLC equipment. The DRSL-U accepts thermocouple, RTD, linear resistance, potentiometer, voltage or current input and converts these signals to linear voltage or current output. The unit offers isolation between input, output and supply, provides surge suppression and protects control systems from transients and noise. The DRSL-U also eliminates ground loops and can be used for measuring floating signals. Low power consumption facilitates DIN rail mounting without the need for any air gap. The DRSL-U is easily configured by using the DRSL-DISPLAY programming interface in conjunction with the DRSL-ADAPTOR configuration adaptor. The DRSL-DISPLAY has a 4 line LCD display with scrolling help text in 7 languages (English, French, German, Italian, Spanish, Danish and Swedish) which guides the user through all the configuration steps. The DRSL-U is designed with electronic hardware switches, consequently it is not necessary to open the device to set any internal DIP-switches.